By Emily Leaman·	 8/13/2013, 12:00 p.m. Since I’m on a bit of a kitchen-hacks kick lately, I thought I’d share another handy tip that’s saved me from many a spoiled salad. 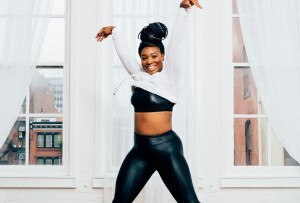 It’s a simple trick with things I am positive you already have in your kitchen. As I’m sure many of you know firsthand, one of the challenging things about living in a two-person household is that food doesn’t usually come perfectly portioned for two people. Take salad greens, for example. I prefer baby spinach and arugula (mmmm), and since my grocery store doesn’t have those bulk, take-what-you-need salad bins, I’m left with the bagged stuff. 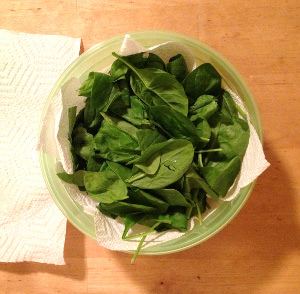 Two bags of greens—one spinach, one arugula, which I then mix together—give me well over a week’s worth of salads for the two of us. So how can I store them to keep them from wilting? I tried many tactics. The first was just leaving them in the bags they came in, but I quickly learned that once opened, those bags become a primo gathering place for moisture, which makes greens wilt and start to stink rather quickly. So I transferred them to a Tupperware container. Better, yes, but the moisture thing still happened within a couple of days. The inner walls and lid of the containers became coated with drips of condensation, which turned my greens to mush. Turning up the temperature in my refrigerator didn’t help. I started to realize that the culprit was the moisture, so if there was some way to keep the moisture away from the greens, I might be in luck. Enter: my good ol’ friend paper towels. Months ago, I began lining my plastic storage containers—I use these Lock & Lock ones, with tabs that seal them shut—with two sheets of paper towel, one lining the bottom and sides and the other lining the lid. 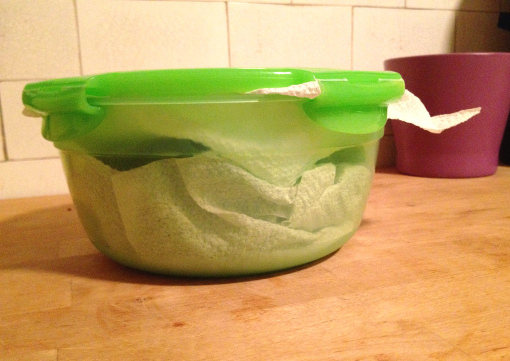 Here’s how it works: After washing your greens and drying them reeeeeally well (you may consider investing in a salad spinner to get as much water out as you can), take a clean plastic container and lay a paper towel on the bottom and sides. 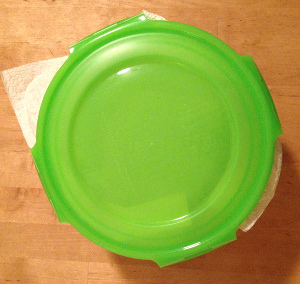 My containers are round, so one sheet works; you may need two, depending on the size and shape of your container. 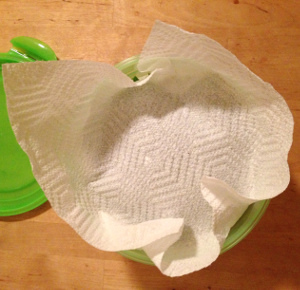 Once you’ve covered as much surface area as you can, put your greens in the container on top of the paper towel. Don’t to pack them too tightly; I’ve learned they need to breathe in order to stay fresh. Then, before putting the top on, put another sheet of paper towel on top of the greens, tucking the sides in like you would a child in bed. Put the lid on, and make sure none of the leaves are touching the plastic top. It’s okay if the paper towel sticks out a little. And you’re done! Using this method, your greens should stay fresh and ready-to-use for at least a week and a half. I’ve even pushed mine past two weeks before, and the greens are still perfectly fresh. Happy salad-ing, Be Wellers.